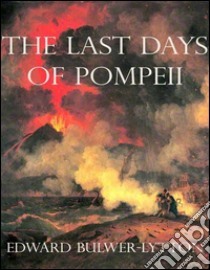 The Last Days of Pompeii is a novel written by the baron Edward Bulwer-Lytton in 1834. The novel was inspired by the painting The Last Day of Pompeii by the Russian painter Karl Briullov, which Bulwer-Lytton had seen in Milan. Once a very widely read book and now relatively neglected, it culminates in the cataclysmic destruction of the city of Pompeii by the eruption of Mount Vesuvius in AD 79. The novel uses its characters to contrast the decadent culture of 1st-century Rome with both older cultures and coming trends. The protagonist, Glaucus, represents the Greeks who have been subordinated by Rome, and his nemesis Arbaces the still older culture of Egypt. Olinthus is the chief representative of the nascent Christian religion, which is presented favourably but not uncritically.